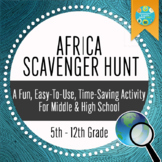 Students will label and color major bodies of water, mountain ranges, and other physical features of the African continent. 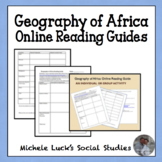 Students use a variety of maps (political, physical, climate, land use, etc.) 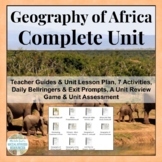 to learn about the geography of Africa. This can be done independently, pairs, or groups. 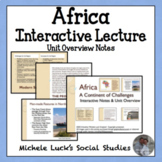 This is a photo-rich, visually stimulating powerpoint with notes on the geography and climate of Africa. 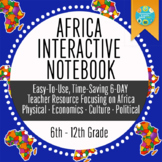 This powerpoint also includes a slide with a blank political map of Africa and several interactive slides to allow students to label the blank political map. 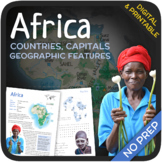 This is a blank political map labeling activity for students to complete using an atlas. There is also an attached list of countries with guidelines for which colors to use when labeling/coloring the countries.